Adopting a healthy lifestyle is important for your long-term health. Switching to a healthy diet, limiting your caloric intake, adding whole grains and consuming more fruits and vegetables will help you maintain a healthy weight in the long run. While these lifestyle changes are important, you may experience a few side effects while your body is adjusting to your new diet. Consult with your physician before making any changes to your diet or if you are concerned about the symptoms you are experiencing. Reducing your caloric intake may make you feel hungry throughout the day. Avoid hunger by cutting out only 200 to 300 calories per day to start. For example, if you are currently consuming 2300 calories per day, cut back to 2000 calories per day in the initial stage of your diet. Making drastic cuts of more than 300 calories may make it difficult for your body to adjust and may cause you to binge eat. You should also make smart food choices when you eat. 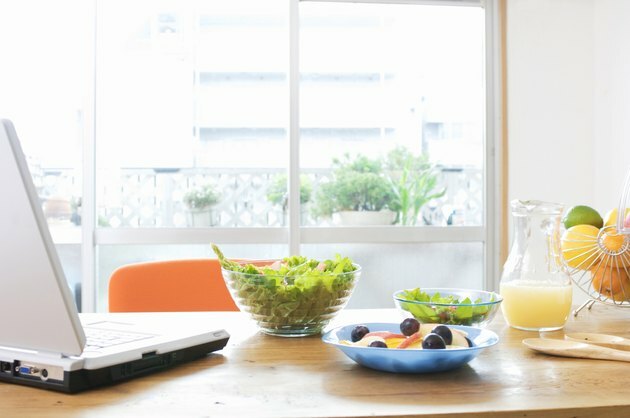 Experts at MayoClinic.com recommend consuming foods that take longer for your body to digest. These foods are high in fiber and include whole grains and vegetables. In addition, high-fiber foods are energy dense, meaning they are high in nutrients while supplying minimal calories. Your body may need time to adjust to the increased fiber in your diet. Adding high-fiber foods too quickly can cause bloating, flatulence, constipation or diarrhea. Consuming beans or legumes may cause additional bloating and gas in your intestines. You can avoid this problem by reintroducing whole-grain foods, fruits and vegetables into your diet in several small portions throughout the day. Add two or three extra grams of fiber each day and see if you feel any digestive distress. Slowly build up your daily intake to 30 to 40 g each day, as you are able to tolerate. Reducing the amount of calories you eat may cause you to feel tired or less energetic in the initial stages, especially if you are increasing your physical activity. Weight loss occurs when your body uses more calories than you consume. The Harvard Medical School Family Health Guide recommends consuming 13 calories per pound of body weight if you are primarily sedentary. For example, if you weigh 150 lbs., you should consume 1950 calories every day. Your caloric needs increase to 16 calories per pound if you are moderately active and 18 calories per pound if you exercise vigorously. Consume enough calories from nutrient-dense foods to avoid feeling tired or fatigued. The Harvard Medical School Family Health Guide: Good nutrition: Should guidelines differ for men and women?